The modern economy, and the job market that comes with it, is a complicated and sometimes overwhelming environment. Spurred by technology, globalization, and political changes, the American job market is professionalizing and becoming more service-oriented, leaving many working adults and career professionals wondering what they need to do to keep their jobs, get ahead, and make a stable and sustainable future for themselves. Many adults who began working with just a bachelor’s degree are finding that they can make the most of their career by going back to school to earn a master’s degree. The Masters of Business Administration (MBA) is still the best-known higher degree in the business field, but the MBA isn’t always suited to the specialized needs of managers who are already working in their chosen career, or who are looking to a career change or promotion into management. But whatever the name, the focus is generally the same. The Master of Organizational Leadership provides an alternative to the MBA that emphasizes communication, motivation, behavioral psychology, project management, and other theories and practices pertaining to leading teams. Unlike the MBA, which includes statistical analysis, accounting, marketing, and other more technical areas, the MOL is an interdisciplinary degree often pulling together outwardly different, but related, human behavior fields. The MOL is designed to be more flexible and more broadly applicable than the MBA, cultivating leadership skills that can be used in a corporate setting as well as government, education, church, non-profit, and entrepreneurial sectors. Since it is designed to appeal to working adults already in their careers, the Master of Organizational Leadership is often available as an online degree, and often in an accelerated format. Because MOL programs seem to be exploding in recent years, non-traditional students looking into an online MOL degree may find themselves in over their heads. That’s where Value Colleges comes in. This formulation allows Value Colleges to guide prospective online students to the program in their area most likely to provide them with the degree they want at a price that will allow them to make a rewarding return on their investment. One of the foremost universities in California, Point Loma Nazarene University is one of the eight liberal arts colleges affiliated with the Church of the Nazarene. As a small liberal arts institution, PLNU emphasizes relationship-building, service, student support, and holistic learning that incorporates education and faith. With its focus on experiential learning and community engagement, PLNU is ranked by U.S. News & World Report as one of the top 20 regional institutions in the west. Point Loma Nazarene University offers a number of online degree programs, including the PLNU Master of Arts in Organizational Leadership. This fully online degree program uses an interdisciplinary curriculum to prepare graduates for leadership positions in a variety of fields, from business and government to education and non-profit. The cohort format allows students to work through the process together, building connections and practicing the kinds of cooperation that defines servant-leadership. PLNU’s tuition is as low as most California public universities as well, cementing its status as a best value. Founded in 1858 as a normal school, Winona State University is the oldest of the Minnesota State Colleges and Universities System, one of the nation’s largest public higher education systems. As a mid-sized regional institution, Winona State has a mission to provide affordable, accessible education to the people of southern Minnesota. Winona State is known for its commitment to community engagement, as well as their dedication to providing educational opportunities that meet the specific needs of the region. One such program is Winona State’s online MS in Organizational Leadership, a program built to provide working adults with the skills in writing, communication, technology, and professionalism necessary to take on managerial responsibilities in innovative and changing organizations and fields. Online students get to take part in on-campus classes through video conferences to provide a stronger connection with the program, and WSU’s low tuition rate makes it one of the best values in the Midwest. Indiana Wesleyan University is one of the most respected Christian institutions in the nation, and a top 20 U.S. News & World Report regional university for the Midwest. IWU is the largest private university in Indiana, and one of the fastest-growing in the nation, drawing students to its balance of educational excellence, affordability, and evangelical worldview. In addition to building its reputation on faith, IWU has also been a leader in adult education, one of the largest components of its growth. Indiana Wesleyan’s professional and career programs are its claim to fame, including such programs as IWU’s online MA in Organizational Leadership. In keeping with IWU’s Christian worldview, the online Organizational Leadership program is focused not only on managerial and technical skills, but on service leadership, responsibility, and ethics. The online degree is built on a cohort model to provide support ad develop real interpersonal skills. IWU has long been recognized as a value in the Midwest, and online programs only extend their capabilities. A small, Catholic institution in the Appalachian Mountains of West Virginia, Wheeling Jesuit University has been ranked by U.S. News & World Report as one of the 20 best regional master’s institutions in the South, and recognized by the Princeton Review and Forbes as one of the best values in the region as well. WJU combines the educational rigor and religious dedication of a Jesuit university with the most current research, professional study, and technology. Like many other religious schools, WJU has used distance education to provide outreach opportunities to students who cannot attend on-campus, including programs such as the online MS in Organizational Leadership. WJU pulls together an interdisciplinary program incorporating finance, social science, law, and more to give students a thorough understanding of the demands on leaders in the 21st century. As a Catholic university, WJU emphasizes ethical and moral decision-making, and with its dedication to opportunity, keeps tuition low enough for working adults. U.S. News & World Report’s #1 regional university in the Midwest, Creighton University is a Jesuit Catholic institution further recognized as one of the best values and most innovative universities in the region. Creighton is a deeply religious community, built on the values of Ignatius of Loyola, founded of the Society of Jesus, including educational excellence, justice, and critical thinking and responsibility. That same commitment and faith informs the Creighton MS in Organizational Leadership, an interdisciplinary program that focuses on innovation, decision-making, motivation, and problem-solving. Students can choose concentrations in Business Leadership or Healthcare Leadership, and tailor their degree to the field they want to pursue. Creighton’s program is designed specifically for working professionals with at least two years of work experience, and will provide graduates with all they need for professional success for themselves and their organization. One of the foremost private institutions in the world, Johns Hopkins University is credited with developing the modern research university from its founding in 1876, providing the model for combining research and education in one institution. Best known for their medical research – the Johns Hopkins name being one of the most trusted globally – Johns Hopkins is also one of the most respected institutions for fields as diverse as music, business, with the nation’s #1 School of Education according to U.S. News & World Report. The top-ranked School of Education is the home of the Johns Hopkins online Organizational Leadership MS program, a 36-credit degree specially-designed for public safety managers and professionals. For emerging leaders in law enforcement, fire and emergency management, public health, and other related areas, the Johns Hopkins Organizational Leadership degree is designed to allow public servants to keep their positions while obtaining the education they need to be world-class leaders at every level, from federal to local agencies. Founded in 1853 by the De La Salle Christian Brothers, a Catholic order dedicated to education, Manhattan College has been ranked by U.S. News & World Report as one of the top 20 regional institutions in the North, and is widely recognized for its high ROI. Manhattan College’s emphasis on professional education, enriched with strong student support and close mentoring relationships, ensures that graduates find themselves on the job market with a respected name and a wealth of options. For busy working adults, Manhattan College’s online Organizational Leadership MS degree program pulls together Manhattan’s excellent faculty guidance, experiential learning opportunities, and up-to-date industry experience. This accelerated program provides students with all they need to develop their managerial skills, motivate and organize teams, and build a personal brand. It’s all the benefits of a traditional Catholic college with the 21st century’s most current, innovative ideas. One of the highest-ranked regional institutions in the North, and one of U.S. News & World Report’s top 25 online graduate educators, Quinnipiac University has its roots in a business school, and innovation, entrepreneurship, and leadership have been central to its mission from the beginning. From management and healthcare to communications and journalism, Quinnipiac is known for bringing excellence to professional education, and has especially made its name in recent years with adult and distance education. Quinnipiac’s online programs have made them one of the most respected distance educators in the nation, with degrees such as the Quinnipiac online MS in Organizational Leadership. Quinnipiac draws on their deep history and current experience in business and management to give future leaders the skills to convert their self-awareness and confidence into motivation, diversity, and data-driven ingenuity. Quinnipiac is recognized as a top value for the return their online degrees provide graduates, and the opportunity the Quinnipiac name guarantees. St. Joseph’s University is a small, private Catholic institution in the Jesuit tradition, founded by the Society of Jesus in 1851. One of U.S. News & World Report’s top regional institutions (#11), St. Joseph’s is especially respected for their business programs, with the Haub School of Business widely recognized as one of the best in the nation (the Princeton Review’s top 25 nationally). The Jesuit value of educating students to their fullest potential guides St. Joseph’s programs, both on-campus and online. With their emphasis on business and service, St. Joseph’s has emerged as a top educator for working professionals and other non-traditional students. Programs such as the online Master of Organizational Development and Leadership at St. Joseph’s give students the qualifications to lead in the 21st century business world. Experiential learning, building on working student’s current jobs and coursework alike, helps students practice interpersonal skills and network-building, and the St. Joseph’s reputation carries graduates onto the job market with a distinct advantage. One of the Deep South’s most influential centers of learning, research, and culture, the University of Alabama has long been recognized as one of the nation’s most significant public institutions. But while UA’s 175 year history is impressive, Alabama has made a leap forward in recent years by developing ‘Bama By Distance, one of the most respected online education programs from a public university anywhere. ‘Bama By Distance offers a uniquely designed program in the Organizational Leadership concentration of its MA in Communication Studies. As the pedigree would suggest, the MACS in Organizational Leadership focuses on the role of communication in building cooperation, motivating employees, negotiating with partners and clients, and more. A low tuition rate and a flexible platform makes Alabama’s online MA a clear winner for working professionals throughout the Deep South and beyond. One of the nation’s most recognizable Catholic institutions, Gonzaga University is a Jesuit university ranked by U.S. News & World Report as one of the top 5 regional universities in the West. Gonzaga is known for their highly-respected liberal arts programs, as well as some of the strongest professional programs in the region, including law, nursing, engineering, and business. In recent years, Gonzaga has also built a reputation for online education and military friendliness. Gonzaga’s online MA in Organizational Leadership is just one of their most successful distance programs, with a mission to combine the Jesuit values of wholeness and service with the demands of modern business and organizations. Two concentrations – Servant Leader and Global Leader – reflect Gonzaga’s central mission, giving students experiential knowledge to take Catholic ethics into leadership. With the Gonzaga name, graduates can count on a reliable return on their time and tuition. The oldest private college in the Rocky Mountains, the University of Denver has its roots in a Methodist seminary, though it is an independent institution today. Ranked in the top 100 national universities by U.S. News & World Report, the University of Denver is especially known throughout the west for their business programs, with the Daniels College of Business noted at the very top by sources such as the Financial Times and Bloomberg Businessweek. With UD’s University College – the College of Professional and Continuing Studies – the University of Denver has become a leader in online education. UD’s online offerings include the online MS in Leadership and Organizations. UD’s online MSLO includes a concentration in Organizational Development, providing students with the leadership skills they need to take charge of businesses and other institutions in need of intervention. By helping students build a personal philosophy and learn the fundamentals of how and why organizations change, the MSLO degree puts graduates in control. Western New England University had its start as an adult-education wing for the renowned Northeastern University, and the commitment to educational opportunity for non-traditional and working adult students remains at the heart of WNEU’s mission. In addition, a dedication to pluralism, student support, and community service drives WNEU’s culture and curriculum, from its traditional liberal arts programs to its highly-ranked and nationally-accredited professional programs in law, business, and engineering, among many others. WNEU offers an online MS in Organizational Leadership that is one of the only such programs in the region. While the degree can be earned fully online, students also have the option of attending evening classes as well, to develop connections and collaborate with other students face-to-face. The AACSB-accredited WNEU College of Business is one of the most respected in the region, and graduates can count on seeing their work pay off in the long run, and on the job market. Recognized as a national university by U.S. News & World Report, and as a top regional institution for the Midwest by the Princeton Review, Saint Mary’s University of Minnesota was founded in 1912 by the De La Salle Christian Brothers, one of the foremost Catholic orders dedicated to education. Saint Mary’s is known for their rigorous education and top-ranked professional programs, and since beginning distance education in the 1980s, Saint Mary’s has been known as a leader in adult education for the region as well. Saint Mary’s has one of the most respected online programs in the Midwest, with programs like the online MA in Organizational Leadership. This 36-credit program can be completed in just 20 months, providing students a grounding in creative problem-solving, critical analysis, and innovative thinking to lead in the constantly-changing modern business world. With Catholic values of ethics, service, and caring, Saint Mary’s Organizational Leadership MA seeks to make leaders with the right skills for now and for the future. Founded in 1871 as a Baptist seminary to train faith leaders for the growing Swedish immigrant population in Minnesota, Bethel University today is a respected evangelical liberal-arts institution. Bethel is known for their Christ-centered and biblically-based curriculum, with a mission to transform global culture with Christian leadership. In recent years Bethel’s investment in online education has allowed them to extend the reach of their mission and become known well beyond Minnesota and the Midwest. The online MA in Strategic Leadership from Bethel University is part and parcel of Bethel’s mission to change the world with Christian values. The Strategic Leadership program schools students in the demands of modern management, from self-awareness, ethics, problem-solving, and emotional intelligence, to make students into change agents. Bethel’s fully online program is offered at a tuition rate comparable to many public institutions, with the support and mentorship of a small liberal-arts institution. One of the nation’s most prestigious private institutions, as well as one of the most politically active colleges in the US, George Washington University is the alma mater of many American leaders, politicians, and civil servants. In addition to some of the nation’s most respected schools of nursing, law, medicine, business, and engineering, GWU is also a world leader in political science, education, and service. GWU’s adult education programs are widely recognized as among the best in the nation. The Graduate School of Education and Human Development at GWU offers an online Master’s in Organizational Leadership and Learning, a program dedicated to making leaders for government, private, and non-profit agencies and businesses. With a focus on awareness, growth, critical thinking, and problem-solving, GWU’s OLL program prepares graduates for the complexities and changes of modern leadership and management, while the GWU name and connections give graduates entry into the highest reaches of the American system. When Jesuits brought Catholic education west of the Mississippi River in 1818, St. Louis, MO, was a frontier trading outpost. Saint Louis University was there throughout St. Louis’ growth into a major metropolitan city, educating the workers, leaders, and professionals necessary to make the city what it is today. Saint Louis University is one of the most respected Jesuit colleges in the nation, and is recognized in the top 100 national universities by U.S. News & World Report, with many individual programs ranked at the very top. The School for Professional Studies at SLU has become a regional leader in adult and distance education, with award-winning programs such as SLU’s online MA in Leadership and Organizational Development. Emphasizing team leadership, applied analytics, and future-forward innovation, the SLU online Leadership degree is made up of 36 credits delivered in a mix of video lectures, online conferences, and an experiential capstone project. Graduates can count on the reputation of Saint Louis University to provide a significant return. The University of Saint Francis is a private Catholic liberal arts institution founded by the Sisters of Saint Francis in 1890. This small, devout university is recognized among the 100 best regional universities in the Midwest by U.S. News & World Report, and proudly combines the religious devotion of the Franciscan tradition with the modern demands of professional life, including top-notch programs in nursing, education, and business. USF offers an online Master of Organizational Leadership degree from the respected Busse School of Business and Entrepreneurial Leadership. Designed for working professionals on the way up in their fields and careers, the online MOL includes four possible concentrations: Non-Profit, For-Profit, Higher Education, and Healthcare Services, drawing on some of USF’s greatest strengths in an interdisciplinary program. With tuition as low as most public universities, USF makes a Catholic education financially accessible. A Lasallian Catholic college regularly ranked among the best in the Midwest by the Princeton Review, Lewis University is known for their commitment to practical, market-ready degree programs and a knack for adult and non-traditional education. Like other Catholic liberal-arts institutions, Lewis keeps class sizes small and emphasizes faculty guidance, experiential learning, and applied knowledge. Lewis offers a fully online MA in Organizational Leadership designed to prepare working professionals for managerial roles in changing businesses and fields. With a focus on the human behavioral aspects of Leadership, the Lewis Organizational Leadership MA offers five possible concentrations, including Higher Education Student Services, Professional and Executive Coaching, and Training and Development. For graduates, a Lewis degree gives employers and clients something to trust. Regis University, a Jesuit institution, has a long-standing place at the top of U.S. News & World Report’s best regional universities for the West. With its roots in the Ignatian tradition of learning and service, Regis is well known for its commitment to the community and the people, including a unique research and action division in the Institute for the Common Good. Regis is dedicated to educating leaders who will make the world a better place through ethical leadership, service, and faith. In that spirit, Regis offers an online MS in Organizational Leadership designed with Regis’ values at its heart. While students can concentrate on Leadership and Management, it is also possible to add other concentrations such as Human Resource Management and Leadership, to create a dual concentration more specifically tailored to the student’s current career path. Courses are taught in an 8-week accelerated format to offer more flexibility and a quicker completion time, getting graduates on the market or promoted in short order. A U.S. News & World Report top 25 regional institution for the North, Rider University has its roots in a small business school that was founded to provide cutting-edge expertise to the post-Civil War industrial revolution. Rider remains at the forefront of business and management education, combining the close attention and support of a small liberal-arts college with a focus on career preparation and intellectual development. Rider’s adult education programs are well-known and respected throughout the region, and their online presence has fueled their growth, both in size and reputation. Rider offers an online MA in Organizational Leadership designed for the specific needs of working professionals, including flexible scheduling and a variety of concentrations, including Developing People & Organizations. 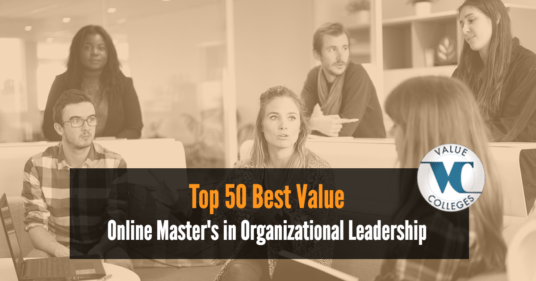 With Rider’s reputation, the online Organizational Leadership MA is a trusted way to move up in a leadership role. Part of the Colorado State University System, alongside CSU’s flagship in Fort Collins, and CSU Pueblo, Colorado State University-Global Campus has its own separate mission and vision. Focused on providing necessary professional and technical education for the people of Colorado, CSU Global has been an online education model since beginning the first public, non-profit, fully online college. The fully online MS in Organizational Leadership from CSU Global is a top-flight program for preparing working adults for the higher reaches of management and training, designed to give professionals access to the decision-making, ethics, and communication necessary for leadership in the 21st century workplace. Students can also choose a dual degree in Organizational Leadership and Management, adding an extra 18 credits to the 36 credits for the single program. Founded in 1971 by a retired Naval officer, National University began with the mission to provide the best possible educational opportunities to working adults in California, especially veterans and military personnel. National’s curriculum is designed for ultimate convenience and flexibility, with scheduling on a quarter (rather than semester) system and generous transfer credits for work experience and prior education. National offers a fully online Organizational Leadership MS that combines experiential practice and theory, including interpersonal skills, technology, and ethics. The MSOL emphasizes leadership and decision-making within communities, focusing on communication and teamwork for creative problem-solving. Students may also choose a specialization in Community Development. National’s low tuition and growing reputation makes it a solid value across the nation. Recognized as a national best value by U.S. News & World Report, Cornerstone University is a non-denominational evangelical institution in the Midwest known particularly for their adult education and professional programs. Dedicated to a Christian, Trinitarian worldview, Cornerstone’s vision and mission emphasizes world change and leadership from biblical values, qualities that define Cornerstone’s curriculum and teaching. Cornerstone’s MA in Organizational Leadership is a prime example of the Cornerstone mission, built on the power that influence, creative decision-making, and faith-based values can have on managing an organization. With Cornerstone’s accelerated 6 and 7 week courses, the program can be completed in as little as 18 months, giving graduates experience and proficiency in the most key areas of 21st century business. The second-largest private Christian university in the US, Azusa Pacific University has become a nationally-known force in higher education in the 21st century, providing a model for other evangelical and religious schools. In terms of innovation, quality, and reputation, Azusa Pacific has succeeded in bringing its God First philosophy into the online realm, putting other institutions in their class on notice. Azusa Pacific’s command of online education has been the largest element in its rise in reputation, with top-ranked programs and a robust student support network. One such program is APU’s online MA in Leadership and Organizational Studies, a 33-credit, 2 year program designed for working professionals to up their credentials and take on the challenges of modern management. Reasonable tuition rates and a strong mix of theory and practice make the Azusa Pacific online LOS master’s a top choice. Geneva College is one of the top regional colleges for the north and a recognized value for their business and management programs. A small Christian liberal arts college, Geneva College is the only institution affiliated with the Reformed Presbyterian Church, and is dedicated to service, Christian faith, and comprehensive education. Recognized as a top value for the North, and a best regional college, by U.S. News & World Report, Geneva is noted for their strong programs in the traditional liberal arts, as well as graduate programs in business, management, and leadership. Geneva College’s online MS in Leadership Studies shows the direction forward to Geneva. This top-quality program is exclusively available online for working adults who want to prepare to engage workplace challenges with honesty, practical wisdom, and a positive work ethic that builds trust and makes contributions in service of God and neighbor. Students specialize in Nonprofit Leadership, Project Management or Ministry Leadership. Geneva keeps tuition low to make their excellent opportunity affordable and accessible to Pennsylvania’s professionals. From a small secretarial school to one of the most recognizable names in online education, Southern New Hampshire University has become a model for higher education in the 21st century. SNHU has been recognized as one of the most innovative organizations in the nation by Fast Company, distinguishing itself as one of the finest institutions for business and entrepreneurship, as well as a leader in online education. SNHU offers an online MS in Organizational Leadership from one of the most recognizable business schools in the nation. This program incorporates the most current insights into communication, human behavior, business research, and other key organizational skills to integrate both theoretical and practical knowledge and experience directly into working professionals’ careers. With SNHU’s flexibility, affordability, and reputation, graduates can count on coming out ahead. York College, a small, Churches of Christ-affiliated institution in Nebraska, is a Christ-centered evangelical college. Founded in 1890, York has not rested on its laurels, and instead has used the technological opportunities of the 21st century to spread its message and education with a growing selection of fully-online degree programs in areas like Criminal Justice, Business and Psychology- fields that help them fulfill their mission dedicated to service to God, family, and society. York offers an online MA in Organizational Leadership. As a master of arts degree, York’s program is more broad-based and flexible to offers opportunity in a variety of fields, from law enforcement and government to business and non-profit. This 36 credit program is taught in accelerated 8-week courses, and with 6 terms each year, students can complete their degree in as little as one year. Extremely low tuition rates make York one of the best values in Christian education. Part of the 10-institution Concordia University System, a higher education system operated by the Lutheran Church, Concordia University Wisconsin is a small institution that has gained a high level of exposure and recognition in recent years. The Concordia name has become a nationally-known brand thanks to Concordia University Online, a collaborative program across the CU system designed to make adult professional and distance education widely available. CUW offers a fully online MS in Organizational Leadership & Administration through Concordia Online, a program highly ranked by U.S. News & World Report. Besides building students’ managerial skills through a merging of Christian values and ethics with cutting-edge leadership theory, Concordia prepares all students for the Institute of Certified Professional Managers (ICPM) Certified Manager licensure exam. It’s one extra bit of value from a program that has been widely cited among the best values in the nation. The University of Wisconsin system is well-known throughout the US for its top-quality education, and in recent years has become a leader in online learning. One of the institutions in the UW system to benefit most from this shift has been UW-Platteville. Formerly a normal school, UWP became a leader in distance education in 1996 when it eliminated residency requirements to allow anyone in the US to take courses, and the establishment of an online degree program in 1999 put Platteville at the forefront of online education. UW-Platteville offers a fully online MS in Organizational Change Leadership, a specialized OL degree program focused on exactly what the title implies – the skills necessary to lead organizations through major changes, growth, and evolution. Students can further specialize in Project Management, Human Resources, or Healthcare to tailor their degree to their current or preferred career. With recognition from U.S. News & World Report and a wide reputation as a best value, UWP is a clear winner. South Dakota’s flagship public research institution, the University of South Dakota is the critical player in the state’s higher education, with the region’s leading law and medical programs, as well as key support professions. With South Dakota’s many rural areas and educational needs, USD has made online education a fundamental part of their curriculum, with some of the strongest online degree programs in the west. Online students can specialize in Organizational Leadership with USD’s Master of Science in Administration online degree. This 36-credit interdisciplinary program offers working professionals the opportunity to develop their administrative, management, and development skills through USD’s highly-respected online platform, with experienced, supportive faculty. USD’s low tuition rate makes it a low-risk investment in the future of government, business, healthcare, and education. A large regional institution with global ambitions, Western Kentucky University’s reputation and profile has been growing steadily and impressively over the 21st century. Ranked in the top 30 regional universities in the South by U.S. News & World Report, WKU is dedicated to meeting the educational needs of Kentuckians, using every means available – including online education, which has helped build WKU’s brand tremendously – to turn their students into leaders. WKU offers a fully online master’s program in Organizational Leadership designed to help working professionals attain their highest potential as managers. This 30-credit program focuses on practical, useful knowledge and skills over vague theory, and puts interdisciplinary data and experience to use. A wide variety of electives allow students to tailor their degree to their current career, or to the career they want to pursue, all for a reasonable, affordable tuition rate. A small, Churches of Christ-affiliated institution in west Texas, Abilene Christian University is known for their academic excellence and active community, earning their place in the top 20 regional institutions for the west from U.S. News & World Report. ACU is dedicated to teaching students to incorporate Christian values and faith into their careers, and developing professionals into Christian leaders. ACU’s online Master’s of Organizational Leadership degree program is a rigorous, Christ-centered program that focuses on giving managers the strategies they need to implement biblical values into their business, organization, or group. This 36-credit program emphasizes communication, relationships, critical thinking, and faith, and an accelerated format makes it possible to complete the program in as little as 18 months, a serious value for those on the clock. One of the most recognizable faith-based institutions in the nation, California Baptist University is a mid-sized, Baptist-affiliated university on the rise, having made its name not only in California, but across the US. With their investment into online education, CBU has become one of the most recognizable names in their class, and earned U.S. News & World Report accolades for their online programs. The CBU online MA in Organizational Leadership is one of the most affordable and convenient programs of its kind in the region, with an accelerated format allowing some students to complete their MAOL in as little as 12 months. This 30-credit program is designed for flexibility, allowing students to take their learning into a variety of fields, from religious organizations to business and government, and begin earning faster than any other competitor. One of the first and most influential land-grant institutions in the US, Michigan State University is a major research university ranked by U.S. News & World Report as one of the top public institutions in the US. MSU is especially known for the Broad College of Business, a pioneering business school that helped define modern business disciplines such as supply chain management, analytics, and hospitality. Michigan State offers an online MS in Management, Strategy, and Leadership from the Broad College of Business. This accelerated program is built on 15 5-week courses that students can complete in as little as 20 months. With video lectures and interactive online classes, the MSU online MS Management, Strategy, and Leadership program is designed to promote teamwork, management, and motivational skills. The Michigan State name, and the Broad College reputation, together give graduates a significant advantage on the job market. Colorado Technical University began with the needs of military veterans and personnel in mind, and from its founding in 1965 to today, CTU has put its priority on career-focused, student-centered learning, whether for veterans, working adults, or professionals changing careers. A regionally-accredited, U.S. News & World Report-recognized for-profit university, CTU is a leader in online education for the western US. Named among the best online business degrees by U.S. News & World Report, CTU’s online MS in Management Organizational Leadership specialization gives students a thorough, experientially-grounded understanding of the demands of leadership. This 48-credit program focuses on decision-making, motivation, and change in a variety of organization types and environments. CTU’s reasonable tuition and convenient online platform has made it a nationally-known choice for business and management. Florida’s leading interdenominational, evangelical college, Palm Beach Atlantic University was founded in 1968 to provide a Christian higher educational option for students in South Florida. Guided by conservative principles of commitment to God, country, and community, PBAU continues in its tradition of service and support between faculty and students, and between the college and the community. PBAU’s professional and career programs integrate faith and work in the lives of their students and graduates. Designed to help working professionals learn to incorporate their commitment to Christian service in their leadership roles, the PBAU online Master of Science in Leadership degree is one of the best values in Florida. With three concentrations – Corporate, Non-Profit, and Organizational – the Leadership MS is grounded in biblical ethics and morals and available fully online. PBAU also offers a special scholarship for first responders, making their online degree even more of a value. A private, nationally ranked doctoral research university in the suburbs of Pittsburgh, PA, Robert Morris University has it roots in an accounting school founded in 1921, and RMU’s School of Business remains one of the most renowned in the region. Recognized for their military-friendliness, flexible day, evening, and online scheduling, and high level of student support, Robert Morris is known as one of the most reliable and reputable online educators in the north according to U.S. News & World Report. RMU’s online MS in Organizational Leadership draws on Robert Morris’ long history of excellence and forward-thinking in business to prepare graduates for management and leadership in the era of information and technology. The RMU MSOL includes courses in change, communication, ethics, and decision making, as well as numerous electives to specialize and focus on the career that is right for the student’s needs. Founded as a bible college in 1944 by the Mennonite Brethren Churches, Fresno Pacific University is a small liberal arts institution dedicated to Christian values and servant leadership. Recognized by U.S. News & World Report as one of the top regional institutions in the west, FPU has one of the highest 4-year graduation rates in the state and a reputation for combining social justice, theological and religious devotion, and rigorous academic standards. Fresno Pacific offers an online MA in Leadership and Organizational Studies that is designed to give working professionals skills and knowledge they can incorporate directly into their current careers. This 36-credit program combines the experienced guidance of expert faculty with the convenience of fully-online coursework that students can complete in just under two years. FPU’s tuition is competitive with many public universities in California, and students get the support that makes all the difference in success. Affiliated with the Assemblies of God Pentecostal denomination, the University of Valley Forge is a small liberal arts college in the suburbs of Philadelphia. With nearly 80 years of experience helping students develop into professionals and leaders, UVF is known for the kind of close personal relationships that only a small liberal arts college can provide – a 14:1 student-faculty ratio, for instance, with strong mentorship and guidance. UVF offers an online Master’s in Organizational Leadership that strives to produce ethical, faith-centered leaders for business, church, and education. Based in the Christian concept of servant leadership, UVF’s online OL degree focuses on integrity and personal leadership. Using accelerated 7-week courses, UVF makes it possible for students to complete their degree in only 18 months, and keeps tuition low enough to make the UVF online Organizational Leadership master’s a top value for the region. One of eight regional Nazarene colleges in the US (along with sister institution Point Loma Nazarene, #1), Trevecca Nazarene University has a history in Nashville, TN, dating back to 1901. TNU is primarily known for its traditional liberal arts curriculum, but in recent years their reputation has grown as they have turned to more career-focused and non-traditional programs in their mission to socially responsible, faithful leaders across the southeast. As a Wesleyan holiness institution, Trevecca’s online Master of Organizational Leadership degree program is designed to unite faith, business, and communication disciplines into a holistic, balanced view of servant leadership. This affordable, flexible program emphasizes personal growth, group cohesion, and organizational impact for an education in leadership that can be applied to a wide variety of careers and fields. A small bible college in the Minneapolis-St. Paul metropolitan area, Crown College is noted among the strongest institutions in its class for the Midwestern region, as well as a consistent best buy among Christian institutions. Crown is affiliated with the Christian and Missionary Alliance, a small evangelical denomination devoted to cultural impact through missions and service, and Crown’s curriculum is designed around the mission to equip Christian leaders in every influential field, from healthcare to entertainment to business. Crown College offers an MA in Organizational Leadership designed for Christian leaders in non-profit organizations, business, and church roles. This biblically-centered curriculum applies Christian ethics, talent nurturing, and spiritual guidance to the world of work and service, preparing students for a variety of career types within the Christian world. At a tuition rate lower than most competitors, as low as many public universities, Crown College is a proven bargain. Founded in 1930 as a small engineering school, the Indiana Institute of Technology (better known as Indiana Tech) has grown into a significant, comprehensive STEM and professional research institution. With a focus on career development in business, engineering, computer science, and other technical fields, Indiana Tech has built a sizable reputation in the midwest, particularly in recent years as an online educator. Indiana Tech’s fully online MS in Organizational Leadership is designed for the working adult to develop career-enhancing skills and earn credentials for greater leadership responsibilities. This 36-credit program covers topics such as human capital, problem analysis, decision making, and business ethics, with the purpose of preparing current and future managers for the complexities of contemporary global business. Indiana Tech offers a thorough education for a reasonable price, the definition of value. The only private, Christian university in beautiful Northern California, Simpson University was founded in 1921 as a bible college, and today offers bachelor’s and master’s degrees in the liberal arts tradition. Like Crown College (#42), Simpson is affiliated with the Christian and Missionary Alliance, and with a highly diverse student body made up of many first-generation college students, Simpson’s mission is to send Christian leaders into the world. Simpson University offers an online MA in Organizational Leadership degree program designed for working adults who can immediately apply their learning to their current careers. Built around Christian principles of justice, integrity, and humility, the online MAOL is centered around service leadership, taught by experienced practitioners, and suitable for a variety of religious, non-profit, and corporate careers. For California in particular, the Simpson MAOL is a low-risk investment. A small, Christian for-profit institution in Forest City, IA, Waldorf University (named for its original location, a former Waldorf Hotel), was founded by Norwegian Lutherans as a business school. Regionally accredited and recognized throughout the west for its quality and value, Waldorf has expanded as a leading online educator after being acquired by Columbia Southern Education Group in 2010. As a former business school, Waldorf’s emphasis is still largely on professional and technical education, and the Waldorf University online MA in Organizational Leadership is one of its signature programs. With seven concentrations to choose from, including Applied Leadership, Emergency Management Leadership, Criminal Justice Leadership, and more, Waldorf’s MAOL gives students the specific knowledge the need for their careers at a surprisingly low tuition rate. Founded in 1908 as an agricultural school, Cameron University is a small, public institution dedicated to professional and technical study, including associate’s, bachelor’s, and master’s degree programs. True to its history, Cameron’s focus is on useful, career-centered programs that develop the professionals and leaders needed throughout Oklahoma and the Midwestern region. Cameron offers an online MS in Organizational Leadership designed to help working professionals succeed in management in a variety of settings, including the military, corporate, and non-profit sectors. This 33-credit program is offered as an incredibly low tuition rate for Oklahoma residents, and only slightly more for non-residents, making the Cameron University MSOL a value almost anywhere. Florida was founded in 1958 to meet to need for top-quality STEM education on Florida’s burgeoning Space Coast. Today, Florida Tech is ranked in the first tier of national universities by U.S. News & World Report, and one of the best regional institutions in the South by the Princeton Review. Florida Tech’s focus on engineering, applied science, and related fields has made it a first choice for many Florida students and a strong recommendation on the job market. Florida Tech has also expanded its reputation with a slate of excellent online degree programs, such as the Florida Tech online MA in Organizational Leadership. This fully online program provides working adults and professionals in many fields with the know-how to lead diverse, multi-faceted professional teams in the modern economy. This 33-credit program is taught in convenient 8-week courses and can be completed in 2 years. A small, regional institution associated with the United Methodist Church, Pfeiffer University is known for their commitment to experiential learning, mentorship, and leadership. As a Wesleyan institution, Pfeiffer prioritizes service and leadership, supporting its students through both faculty and peer mentoring and encouraging students to engage with their communities in many ways, from local to global activities. Pfeiffer’s online MS in Leadership degree is a 27-credit program designed for the convenience of working professionals. With two concentrations – Human Resources or International Management – the MSL program allows current professionals to tailor their learning to the area that will most benefit them, both in their current careers and their future endeavors. Students can complete the program in less than 2 years, at a tuition rate comparable to many public universities. Founded in 1914, Colorado Christian University is currently the only evangelical Christian college in the Rocky Mountain region, and is considered one of the finest institutions of its kind in the west. As an evangelical institution, CCU is focused on bringing Christ-centered, biblical values to education, and their emphasis on the specialized needs of non-traditional and other adult students ensures that CCU will continue sending Christian leaders into the workforce. CCU’s online Master of Organizational Leadership degree program is made up of a 36-credit curriculum prioritizing the Christian concepts of servant leadership, social responsibility, and global impact. The online MOL curriculum prepares students for high-level decision-making in a variety of industry, government, religious, and educational settings, from healthcare to human rights, all at a tuition rate that has made CCU a noted value. Founded in 1944 as a small bible college, Lincoln Christian University takes pride in combining the biblical, Christ-centered values of its bible-college past with its diverse, professional and career-centered present. LCU’s curriculum is designed to put faith at its core, and prepare students and graduates for leadership in the church, their families, and their careers. With a small student body and classes, students count on LCU for mentorship and guidance on-campus and online. The LCU online MA in Organizational Leadership is a faith-based, flexible degree program that is as well suited for pastors and CEOs as for small-business entrepreneurs and non-profit managers. With courses in vision, strategy, change, conflict, and more, LCU MAOL students are led through courses one at a time for focus, completing their program in as little as 21 months. The LCU name is known and respected within evangelical circles throughout the Midwest, and trusted as a low-cost value.